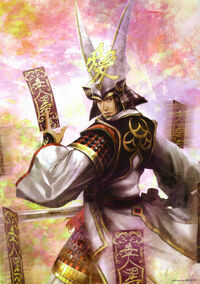 Kanetsugu first serves his lord Kenshin in his famous campaigns, Kawanakajima and Tedorigawa. He helps his lord's tactics against his rival and Nobunaga by protecting their allies from danger and executing missions personally given to him. After his lord dies from illness, Kanetsugu joins the western assault on Odawara Castle years later. Whilst walking in the camp, he meets Yukimura and Mitsunari. Tied together by their ideals of honor, the three men form an oath of friendship.